Where can I find Airedale breeders in my area? Our local club is in Atlanta. You can contact them at: Airedale Terrier Club of Greater Atlanta at their Facebook or Website pages. How should I choose a breeder? What should I expect from my breeder? the animal shall be replaced in the case of hereditary health issues that are debilitating to the animal, and f)the animal shall be spayed or neutered (unless there is a special agreement; i.e. potential show prospect). Many breeders will sell puppies only on a limited registration with the AKC, unless there is a special agreement. Your breeder should make himself/herself available to answer questions and try to help solve problems (should they arise) in the future. Good breeders accept responsibility for dogs they produce and take them back if they need help, reevaluating and placing them in suitable new homes. Irresponsible breeders fail to live up to these expectations. Limited Registration with AKC, means that the dog is registered but no litters produced by that dog are eligible for registration. Limited registration means that the dog may not be entered in breed competition at AKC licensed events, but may compete in other licensed events such as Herding Trials and Obedience Tests. As is the case with all dogs, both the children and the dog must be taught to respect each other. Children must be taught that taking toys or bothering the dog while he/she is eating are not good habits. Also, the dog should be taught that jumping on people or “mouthing” are not acceptable traits. Every household will have a different set of rules (which should be carefully considered before getting any dog) which must be clearly and consistently conveyed to everyone (adults, children, and the dog). With proper training and patience, Airedales are wonderful with older children. I, personally, would never leave a young child and any dog together unattended. It is very advisable to seek the advice of an expert in training when introducing your dog to children. It is very important for the dog to maintain the position of “dog” within the hierarchy without discounting the importance and needs of the dog. Is a fenced yard “required” for owning an Airedale? A fenced yard is almost always a requirement for owning an Airedale because they will chase other animals! Before bringing a dog in to your household, you should consider what you will do on days that you are sick, running late, or for some other reason unable to walk the dog. Many areas have some type of leash law and, for the health of the dog, you should never allow the dog to run freely, without some type of boundary. Remember that Airedales were bred to hunt and terriers, in general, will chase “furry creatures” with reckless abandon for fun and disregard for danger. Dedicated leash walkers or runners can be matched with the right dog; e-fences are not suitable for prey driven dogs. Is it true that Airedales are good for people with allergies? While it is true that many people that are allergic to some other breeds seem to have fewer problems living with Airedales, the fact is Airedale are NOT hypo-allergenic. There are other breeds, (for example; Poodles which are also “less allergic”, which may suit you and yours better. dog a good choice for me? Airedales are very adaptable into new environments. Like most animals, they respond very well to loving and structured situations. Older dogs are sometimes more desirable for a specific situation than puppies. One example is a family or person that simply doesn’t want to deal with housebreaking a puppy. Maybe you are a little older and want the companionship of a dog but not the energy of a puppy. What if you are a jogger and want a companion? It is not advisable for a young puppy to jog! There are lots of situations where an older animal may be a better fit into your home. Older animals may include rescues (for whatever reason) or older animals that a breeder may desire to place into a good home. Always get as much background on an animal as possible. Medical information should be provided. If you think that an older animal is better for you, then you must also consider the “retraining” that may be needed. Dependent upon the situation that the animal comes from this could vary from housebreaking to teaching the animal that even though it was OK to sleep on the couch at the old house, the rules here are, on the dog bed in front of the fireplace. One breeder suggested that a good approach when dealing with an older animal is to treat it like a puppy, assume that he/she knows nothing and let him/her earn their freedom. Should I “crate-train” my Airedale? In my opinion, crate training is a definite plus. It should not be used as a substitute for training your Airedale to have manners and live within the rules of the household but rather as a safe, comfortable “den” for your pet to rest in. It is also a safer way for your dog to travel. Teaching your dog that his/her crate is his/her space can be invaluable when company arrives, when he is being housebroken, and if your pet ever has to be confined for medical reasons. I have experienced having a dog which went in for major surgery and had to be sent home early, because she was “freaking-out” at being confined. Hi My name is Barbara Artieta and I live in Prairieville,Louisiana. My husband and I are looking to adopt a Female Airedale. I have had Airedale’s my whole life and I presently have a male rescue named Billy. Hi, Barbara. Thank you for your note. 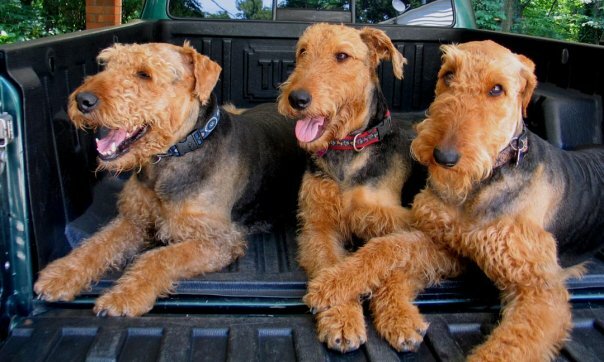 Have you tried through the New Orleans Airedale group? We typically don’t adopt outside of our area except under special circumstances. Please check with Zana Curley, kcurley384@aol.com; or Delia Hardie, noladales@yahoo.com. Thank you and good luck, Barbara.